PINE BLUFF, Ark. 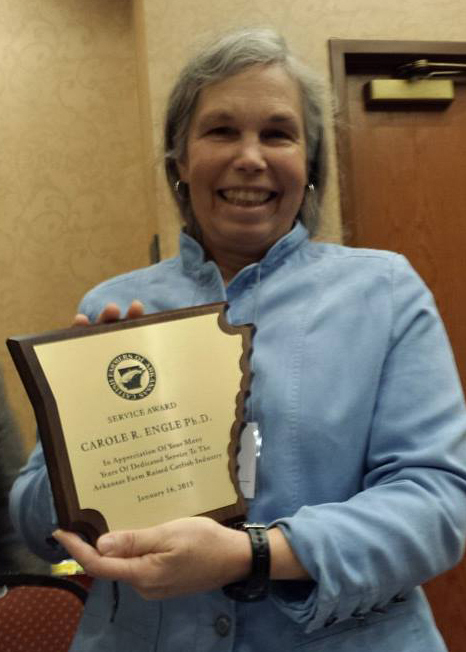 – Dr. Carole R. Engle, director of the Aquaculture/Fisheries Center of Excellence at the University of Arkansas at Pine Bluff (UAPB), recently received the Distinguished Service Award from the Catfish Farmers of Arkansas (CFAR). The ceremony was held at the organization’s annual convention in Hot Springs, Ark. Under Dr. Engle’s leadership, the UAPB Aquaculture/Fisheries Center of Excellence provides industry support on a state and nationwide basis by providing research-based guidance in many areas that include new production technologies and pond and hatchery management strategies and their economic trade-offs; marketing strategies and changing consumer preferences; fish disease diagnosis, treatment, and management; nutrition and feeding strategies and equipment development. Dr. Engle’s primary research focus has been the production economics and marketing of catfish and the optimal management of catfish farms. She has also provided research-based economics information on a number of policy issues that include food safety and inspection, invasive species, federal assistance programs, risk management programs and effluent guidelines. She has published four books, 107 refereed journal articles, and more than 120 book chapters, monographs, proceedings and Extension publications. The CFAR is comprised of catfish producers, suppliers, industry-related businesses and research and Extension personnel based in Arkansas. February 11, 2015 in Research/Extension.